U.S. Senator John McCain expressed pessimism over the political crisis in Lebanon and called Hizbullah a "cruel militia" that "badly wants to retain control over telecommunications and surveillance" in the country. 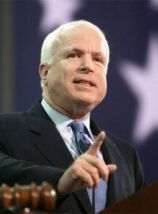 "In recent days we've seen the portents of new political crisis in Lebanon and, while all of us must hope that it will be resolved easily and peacefully, we know from the history of that country that it very well may not be," McCain said in a speech on the floor of the Senate to commemorate the 9/11 attacks on Friday. "Hizbullah has been intent on thwarting these efforts to form a cabinet," McCain said about MP Saad Hariri's attempts to form a government. Cabinet "talks have broken down over the demand by a Hizbullah-allied party that it retain the telecommunications ministry," McCain said in his speech about the Free Patriotic Movement's demand to keep the telecommunications ministry with Minister Jebran Bassil. "This may appear to be a small and insignificant point of contention, and surely not one that would prompt an incoming prime minister to abandon his post, until we consider that Hizbullah badly wants to retain control over telecommunications and surveillance in Lebanon," the senator said. He said Hizbullah not only possesses a surveillance capacity and an independent communications and broadcasting system, "but also retains vast weaponry befitting its status as an independent militia." He also accused the Shiite group of inviting foreign meddling in Lebanon's local affairs and added that Washington "should take a strong stand in favor of respecting the outcome of the June democratic elections, and urge the parties in Lebanon to form a government in a manner that respects the constitutional process." McCain warned in his speech that there can be no durable peace in the country "as long as Hizbullah continues to act freely as an armed, independent militia." "According to some reports, Hizbullah remains today the best armed force in the country – better armed, indeed, than even the Lebanese Armed Forces. Such a situation invites further fighting at some point between Hizbullah and Israel," he said. McCain believed the U.S. should make clear to Syria that better ties with Washington "will require an end to its malign interference in its neighbor's affairs." "Some Americans might reasonably ask why. Why should we care about the freedom and democratic aspirations of the Lebanese people?" McCain said. "In Lebanon, as in so many other places around the world, the population aspires to something better than to be pulled from side to side by a thuggish and cruel militia," he said. "As Americans, we must demonstrate that we stand beside them in this hope."